Google blacklist: Bisexual banned from autocomplete no longer. Searching for “bisexual” on Google now turns up some autocomplete suggestions, after years of campaigning by activist groups. Type “hete” into Google’s search bar, and it will suggest the word “heterosexual.” Type “homos” and it offers “homosexuality.” Enter “ase” and you get “asexual.” But start typing “bisexual” and there’s a good chance you’ll be greeted with a blank screen. That could be changing, though. A bisexual rights group has been pressuring Google for years to remove “bisexual” from its list of taboo terms that return no autocomplete results, and now the activists are claiming victory. “It’s not every day one of the biggest companies in the world changes its mind, but we are thankful that Google now sees bisexual people just like everyone else,” wrote Faith Cheltenham, president of the nonprofit BiNet USA, in a blog post this week. Cheltenham tells me in a phone interview that her volunteers first noticed the change on Aug. 21 and are now seeing terms like “bisexual quotes,” “bisexual rights,” and “bisexual parenting” appearing on the site. “Bisexual” was among hundreds of words identified as part of an apparent Google Blacklist two years ago by the hacker site 2600. The terms ranged from the potentially benign—“adult,” “amateur”—to the truly offensive, which you’re welcome to look up for yourself. 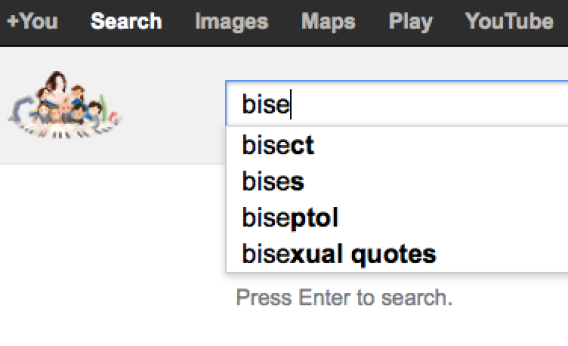 On my browser, Google still does not autocomplete the word “bisexual” nor offer any suggestions when I type in the full word, though it does propose “bisexual quotes” as the fourth result when I type in “bise.” Autocomplete suggestions can vary based on multiple factors, including your personal search history when you’re logged in to the site. I’ve asked Google for comment and futher clarification and will update if I hear back.